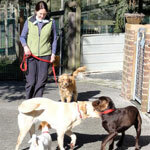 "Your facility there at Macclesfield is second to none & your innovative approach - setting up all the various environments makes it easy to learn how dogs react in all situations." 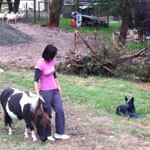 "I came across Greg Fontana at Alpha Dog Training. He has it, the answer, the methods, the trained dogs, and the results, everything I was looking for. The course he runs is not just text book regurgitation, he has his own theories, tested them on thousands of dogs and they work. Aggressive dogs, timid dogs, stubborn dogs, hyperactive dogs, any type of dog you can throw at him." "Since completing the course I have visited many clients in their homes with, thanks to Alpha, my very well trained demo dog in tow. And also thanks to Alpha I am now armed with the knowledge, skills and ability to teach both clients and their dogs a training method that achieves REAL and LASTING results. 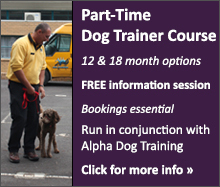 I know I have what it takes to be a competent, confident and successful dog trainer and endeavour to continue my learning and improving my skills the Alpha way!" "For me, the time spent with Greg and some of his team over these two weeks was the most instructive and stimulating that I have encountered for many years. It confirmed to me that pursuing a career in helping our canine friends achieve a happier place within the human world was extremely worthwhile." 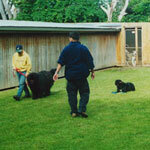 "Another great aspect of the course is the client interaction through Alpha dog training twice weekly classes. Being involved in the classes initially as an observer, then helper and finally a trainer allowed me to learn about the teaching styles of the other trainers and develop my own confidence and teaching technique without being "thrown in at the deep end". 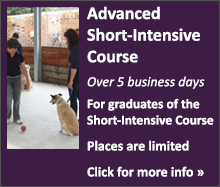 This gradual induction not only helps Alpha maintain an exceptional level of skill and knowledge for the client it also allows a trainee to develop their own skill level before having to deal with a problem dog." 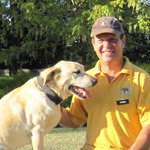 "Greg – You taught me the foundation principals of your training method and taught me to recognise the important factors in handling dogs. 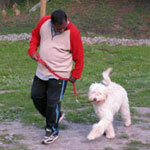 You taught me the importance of showing leadership to the dogs and what are the important things to teach dog owners. Anything I didn't understand all I had to do was ask and you were able to show me how to handle the situation, in a way I could easily understand. I'm grateful to you for encouraging me and explaining everything in such detail that I could understand, especially when the knowledge and skills I brought with me were clearly inadequate." "Even my 11 year old son now is able to handle my dog who was earlier terrified of it because it used to jump and growl at him. And when he does it with such ease, I feel a deep satisfaction within myself that my decision to choose Alpha has turned out be the best choice. 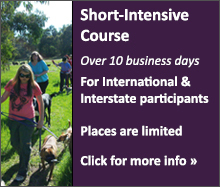 When I look back those three months of my intense search on the net for dog training institutes and try to follow my instinct in choosing the right one among more than 15 or so with whom I was in touch, I am always glad that I chose Alpha." 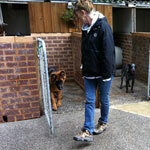 "The visit to the Alpha Dog Training on Wednesday and Sunday were an eye opener. We were able to see so many breeds of dogs and some breed like the Akita and Pit Bull were banned in our country. It is amazing to see Akitas and other so called \"aggressive dogs\" doing Sit-Stay next to each others and mixing well together with smaller breeds. The Alpha trainers were friendly and helpful to us and were prepared to share their experiences even though we had not met each other before. We were also impressed with the so many trainers during the training sessions which is a real plus when it comes to the customer's demands." © Copyright Greg Fontana, Training Director, The Alpha Canine Group 2011. Creativity by Ladybug®.